Last week our garage door opener went on the fritz. After briefly attempting to get it working I came to the conclusion that the motor was fried. I am not surprised as the garage door opener was about 10 years old and got a lot of use. So I went out and purchased another 1/2hp craftsman garage door opener figuring the installation would be easier, which I am happy to report it was. To replace the garage door opener I simply had to disconnect the motor assembly from the hanging brackets, the extended rod from the header bracket above the garage door, and the lifting arm from the garage door. All I needed to do this was a couple of wrenches. Installing the new garage door opener was a snap. All I needed to do was assemble the chain bar sections together and attach one end to the new motor assembly. I then ran the chain around the pulley system at the far end of the bar, then back around the sprocket on the motor and then back to the sliding arm bracket on the bar. I used chain link clips to fasten the chain to the sliding arm bracket. I also attached the lifting arm to the sliding arm bracket. I then connected the far end of the chain bar to the bracket sitting over the garage door and then raised the garage door opener motor assembly up and attached it to the existing hanging brackets. Finally, I attached the arm assembly to the garage door. I was able to use the existing optical sensors and switch to open and close the garage door. All I had to do was connect the existing wires to the garage door opener motor assembly. After connecting all the switch and sensor wires and plugging in the garage door opener in, I tested it out. After a few minor adjustments, with the simple twist of a couple of screws, the garage door was opening and closing properly. After installing ceramic tile on the walls and floor of a custom shower next comes grouting. Grouting shower tile is really no different than grouting any other tile. However, I do recommend starting with the shower walls and then moving on to the shower floor. To grout shower tile you will need the standard grouting tools, which includes two buckets, a grout float, and a large sponge. A screwdriver also comes in handy. The first step in grouting shower tile is to check the tile seams for any excess thinset mortar. Use a screwdriver to chisel away any excess grout in between seams. To grout shower tile first mix in a bucket about 10-12 lbs of grout with about 28-32 ounces of a grout additive. Make sure to mix well until you get a pasty pancake batter consistency. This will give you enough grout to apply during a 30 minute period. You do not want to mix up too much grout as otherwise it could become difficult to work with. In addition, you need to begin to clean the grouted shower tile within 15 to 30 minutes after applying the grout. To grout the shower tiles, use the grout float to work in grout in between the ceramic tiles. Slide the grout float at a 45o angle over the corner joints to work the grout into them. After applying grout to one shower wall, wipe down the grouted tile wall with a sponge and a bucket of clean water. Start the cleaning process in the order that you grouted the tiles. To clean the grouted tiles, only make 2 or 3 sweeps with the sponge before rinsing the sponge. Make sure to keep turning the sponge in between sweeps. After you have wiped down the first wall, grout the next wall and repeat the process. After wiping down the second wall, go back and wipe down the first wall once again. Continue this process on all of the shower walls and then move to the shower floor. After grouting all of the shower walls and floor, wipe them down again with a sponge and clean water after about 30 minutes. Cheese cloth also works well to help buff the tiles to a shiny clean surface. After about 48 hours apply two applications of grout sealer over the tile and grout lines to protect the tile and grout from mold and mildew. Last weekend I completed my latest custom tiled shower project. It was a complete custom ceramic tile shower renovation project. I have to say it came out beautiful after a lot of planning and work. The project took four weekends to complete. The first weekend was dedicated to removing the old ceramic tile and backer board. The second weekend involved installing a mortar shower pan and new cement backer board. The third weekend was dedicated to actually tiling the shower walls and shower floor. The last weekend was associated with grouting the shower walls and tiles, and doing last minute touch up items such as caulking seams. In the process of installing the custom tiled shower I filmed and documented the entire process. I have posted a number of new videos associated with tiling a shower at HomeAdditionPlus.com. 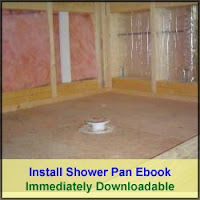 In addition, I updated my “Shower Pan Membrane Liner Installation Ebook” and generated a new Ebook titled “How to Tile a Custom Ceramic Tile Shower”. 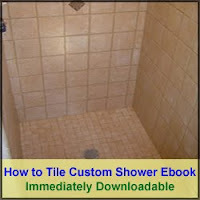 If you have plans to install your own custom shower, be sure to check out these Ebooks. They provide step by step instructions on building a custom tiled shower and are loaded with instructional pictures. So now that I have completed the custom tile shower, I move on with my master bath remodeling project. In the ensuing weeks I will remove the old bathroom vanity and sink, as well as the toilet, and ceramic tile the bathroom floor. I will then install a new bathroom vanity and sink, and reinstall the existing toilet. Stay tuned for more updates and videos.